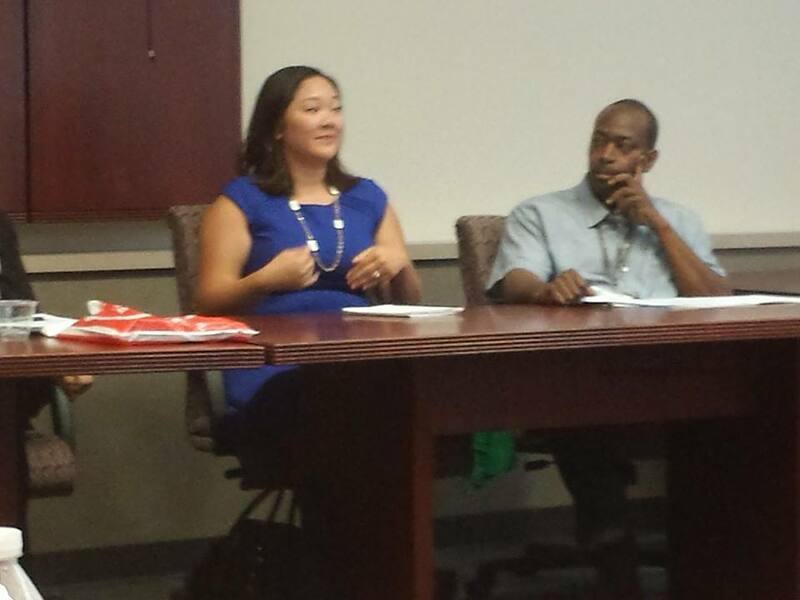 Today our Executive Director, Hillary, was a panelist at the Community Partnership for Transition Services (CPTS) Institute, a regional conference for community organizations, law enforcement and clients to come together to discuss transitional services. This year’s theme was The NEW NORM: How to Stay in the Game with Re-Aligned Resources. Hillary was honored to be a panelist and have the opportunity to share the great work that Bright New Day is doing. This was an exciting opportunity to meet other organizations that are working towards the same goals. See the conference booklet here and learn more about CPTS on their website. Special thanks to Dennis Loney of Workplace Innovations LLC for attending the conference with Hillary and for taking this photo. 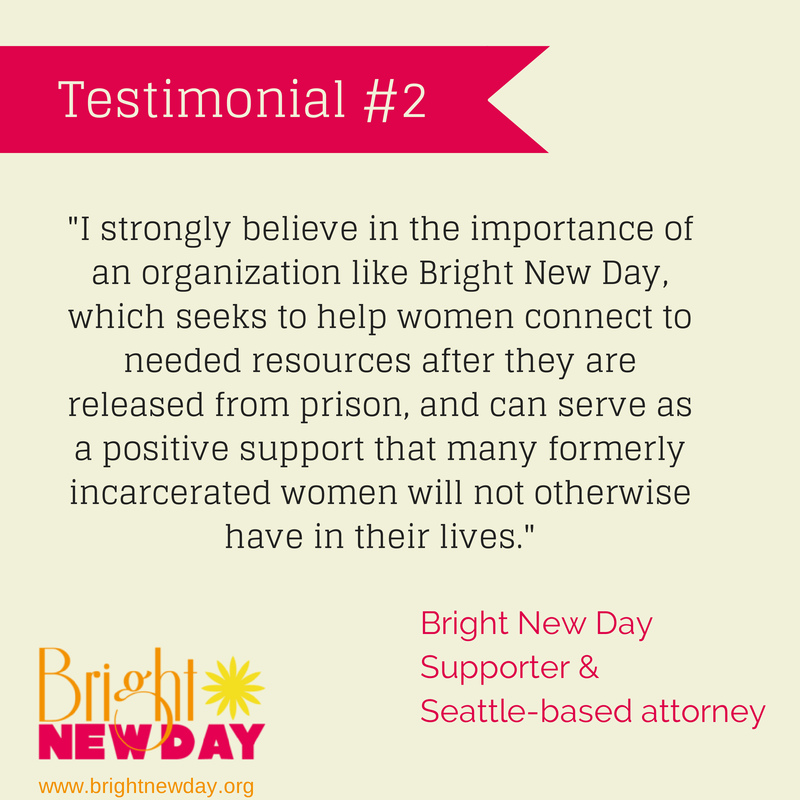 We would like to take a few moments of your time to share about our work at Bright New Day. Over the past 6 months, we have continued to see the need for services like ours and we look forward to the opportunities that are ahead. We have worked with a variety of clients including women who have struggled to find housing post-incarceration, women who needed to connect to resources for medical attention and women who were looking for guidance in a time of extreme transition. All of these experiences have shown us that now, more than ever, Bright New Day is an organization that will continue to change the lives of women for many years to come. Because of this, we truly believe that we must get back to creating the foundation of our organization. For the remainder of 2014, Bright New Day, a volunteer-led organization, will be working on design and capacity building. During this time, we will not be offering direct services and we will be focused on resource development and community coordination. 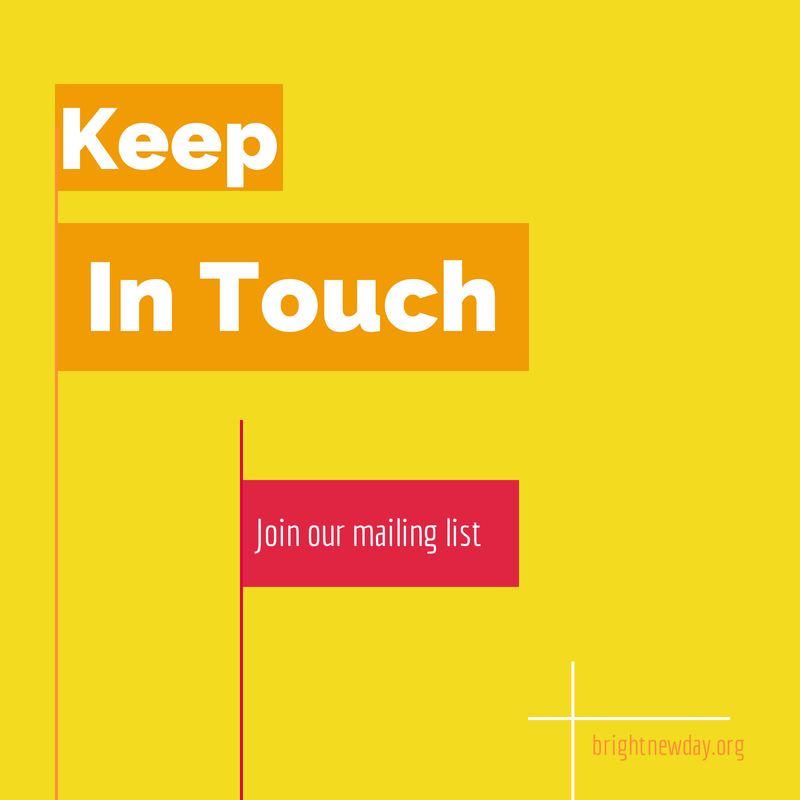 All inquiries regarding our programs and goals for 2014 can be sent to hillary@brightnewday.org. We look forward to sharing news and information as it arises and we hope that you will stay connected. What Do Supporters Say About Bright New Day? Today we are delivering toiletries and clothes to our recently released clients. Upon release, they are provided with one change of clothing, an average of $40, a two week supply of prescription medication, and possibly a bus ticket or money for transportation. We are able to provide these items because of our very generous donors: CAbi, Salon Sovaga, Maple Leaf Ace Hardware, and Dr. Sako, DDS. Without your support, we would not be able to provide these essentials to the women we serve. 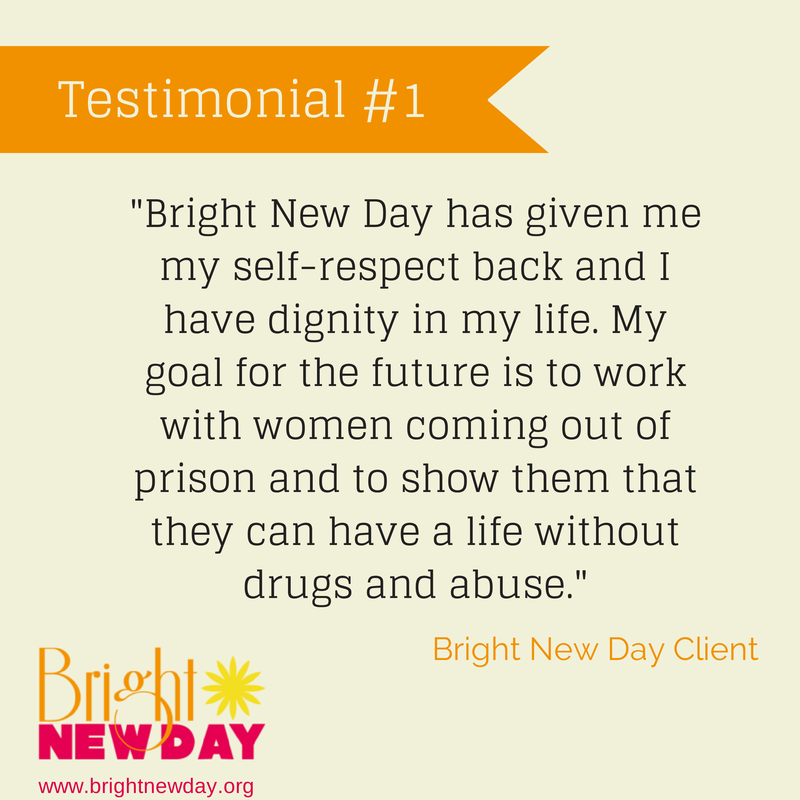 What Do Clients Say About Bright New Day? Over the next few weeks, we will be sharing testimonials from our clients and supporters. We do this work because of them; they are what fuel us. Last month there was a really great piece on the PolicyMic about women in the prison system. I invite you to head over to their website and read the article. Also, please check out the video below to learn more about the rising rates of incarcerated women. When we incarcerated a woman, it isn’t only about them. What about their children? As we prepare to head into the heart of Spring, we’d like to share a few thoughts on where we are, where we are going and how you can help. As a start-up, with limited resources, we have worked with some of the best experts in their field on developing a strategic plan that will carry out our mission. To do this, we recognize that our programs need to be well planned, professionally delivered and sustainable. We have confirmed that it is valuable to take the time to move forward with a clear, focused and planned purpose. To do anything less would be detrimental to our clients – women in need of sustained professional assistance to navigate the difficult maze of reentry into society. After speaking to our stakeholders, professionals in the field of corrections, social work, health care, employment, education and curriculum development, we know that delivering services without every detail in place – validated programs, certified counselors, a network of service providers – would not only be irresponsible, but also unjust to the women who count on our commitment. This is a daunting but wonderful challenge and we are approaching the opportunity with great care and enthusiasm. Our commitment to these women and the community-at-large is quality and sustainable services that result in a better life – one where our clients connect to the resources they need to develop the life skills and social supports for futures as productive members of society. 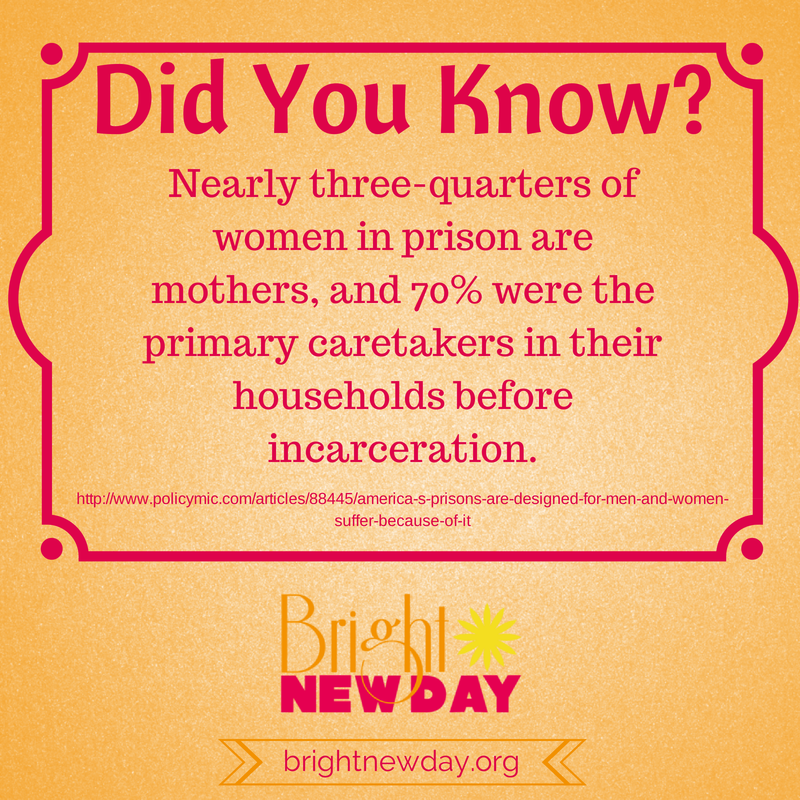 So how can you help us as we continue to build an organization that supports women who are or have been incarcerated? Join us on Tuesday, May 6th for the Seattle Foundation’s giveBig event. You can participate online and your gift will be stretched even further as all gifts made on May 6th between 12:01 a.m. and 11:59 p.m. will be matched by the Seattle Foundation. So please mark your calendars and support Bright New Day. If you are interested in learning more about Bright New Day, please don’t hesitate to contact our Executive Director, Hillary U. Bright New Day is participating in the Seattle Foundation’s Give Big on May 6, 2014! We strive to develop and provide wraparound supports that strengthen families, reduce domestic violence, and reduce recidivism. About 1.5 million people are incarcerated in the United States. Of them, 95% will be released back into the community. Each year, nearly half of the prison population is released. Formerly incarcerated people face nearly insurmountable barriers to successful reintegration. These include limitations on where they can live and be employed. In response to the increasing corrections costs (~$31,000 per inmate per year), and the harmful effects of large-scale incarceration on families and communities, the need for programs that contribute to post-prison success are critically important. To learn more about our programs and to donate, visit the Give Big website.